You and your fellow players are all trying to make the best fireworks show that you can, in this case by playing sequences of colored and numbered cards in order to form sets from 1 to 5. You must play cards on other cards of the same color, and you must play a higher number than whatever has already been placed (i.e. a green 4 on another green 4 is wrong, as is putting a red 1 on a red 2, but putting a yellow 3 on a yellow 1 is perfectly okay). If you act incorrectly the fuse burns down, bringing you one step closer to ending the game early. At the end of the game, you count up the total number of cards played correctly and score that many points. This would all be very easy if you could see your own cards. Instead, each player has a hand of five cards which they show to the other players, without looking at their own hand. There is a shared pool of hint tokens that you can spend to identify some set of cards in another player’s hand, but once the tokens are all used up you can’t give any more hints. The only way to get more hint tokens is by discarding cards from your hand and bringing yourselves closer to ending the game by running out of cards in the deck. As if that weren’t enough, your hints are limited to a very specific form: you may only identify every card of a given type in someone else’s hand. This means that you can indicate the set of all yellow cards, or the set of all twos, but you can’t tell someone about their yellow two and you can’t tell someone about something not in their hand. Saying “none of your cards are red” is not a legal hint. It’s also important to remember the composition of the deck: there are three 1’s of each color, one 5 of each color, and two per color of every number in between. This makes identifying 5’s fairly important, and discarding 1’s far less risky when you’re aiming for a high-scoring game. The tension of the game revolves around reading as much as you can from the fairly limited hints your partners can give you, and every so often making a good lucky guess when you absolutely have to move the game forward. So, if you’re interested in playing with figurative explosives, this is an excellent way to do it. I suggest that you check it out. 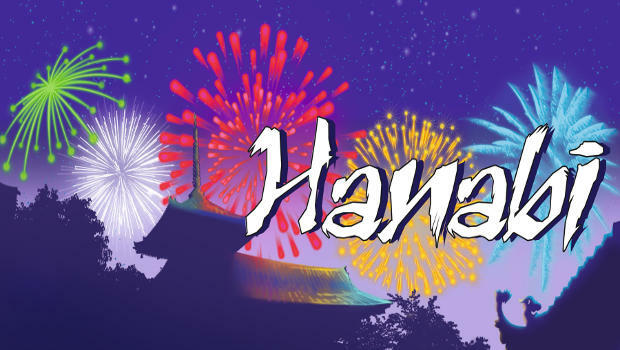 This entry was posted in Game Design, Game Reviews, Games and tagged card games, cooperative, fireworks, Hanabi, Puzzle. Bookmark the permalink.